Katelyn K. Empey is an associate attorney in Slovak Baron Empey Murphy & Pinkney LLP’s (SBEMP) civil litigation department. Ms. Empey’s practice encompasses a wide variety of matters, including environmental, land use, Native American, labor and employment, and public agency law. Ms. Empey has experience in the areas of CEQA litigation and compliance, and has successfully represented clients in resolving complex CEQA disputes. Ms. Empey regularly advises clients on the complex laws impacting public agencies, including environmental laws and regulations, medical marijuana law, Proposition 218 and 26, statutory powers, and public contracts. She has also worked on a variety of cases in the firm’s civil litigation practice, including election contests, employment law, personal injury, and Indian Tribal disputes. Ms. Empey has also successfully assisted in estate administration and conservatorship matters. 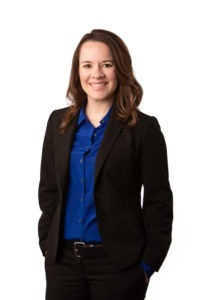 While at SBEMP, Katelyn has worked on behalf of law enforcement, public agencies, Indian Tribes, and private citizens on complex civil litigation. During law school, Ms. Empey was a Speaker Chair for the Loyola Los Angeles Environmental Law Society, and represented the school in the 2013 Environmental Law Moot Court Competition where her team was awarded best brief in its category.